The Minnesota & Pacific Railroad, founded in 1857 as the state’s first railroad and the original predecessor of the Great Northern Railway, began as a simple line connecting Stillwater, Minnesota, to St. Paul with aspirations to eventually run between St. Paul and the Red River Valley on up to the Canadian Provinces. On September 9, 1861, the first steam locomotive—a small, balloon-stacked 4-4-0 American type built that same year by Smith & Jackson of Patterson, New Jersey—arrived in Minnesota. It was small by today’s standards; the combined length of engine and tender was just shy of 51 feet—shorter than one of today’s typical boxcars. 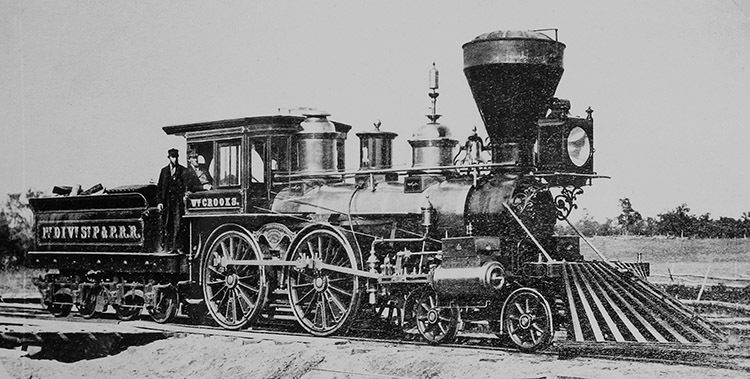 It proudly carried the number 1 and when it went into service in 1862 it was named in honor of the railroad’s chief engineer, William Crooks, who had become a colonel in the Minnesota Volunteer’s Sixth Regiment during the Civil War. The Wm. Crooks would become an ambassador of the nation’s rail history, and rests today inside the Lake Superior Railroad Museum inside Duluth’s historic Union Depot. The preliminary action of moving this engine from New Jersey to the trading post at St. Anthony Falls—the headwaters of the navigable Mississippi—was no small undertaking. Like other pioneer engines, it was probably carried as deck load on a Great Lakes barge to the Port of Milwaukee. Once unloaded and steamed, it made its own way to the barge landing at La Crosse over the rails of the Milwaukee and Prairie du Chien Railroad, later a part of the Milwaukee Road. Final entry into St. Anthony Falls—today’s Minneapolis—was made by river steamer. The Crooks was loaded onto a barge at La Crosse after a good deal of trouble then pulled as far north as could be accomplished by river steamboat. Among the witnesses to this event was the Canadian born James J. Hill, a young, 24-year-old entrepreneur, shipping agent, steamboat owner, and merchant in basic commodities. Although he was the first coal dealer in St. Paul, his contract with the new railroad was for the cords of wood needed to fire the line’s first locomotive. Some 29 years later Hill would own not just the locomotive, but the entire railroad. Months passed between the time the little engine arrived and when enough track could be built to operate a first train from St. Paul to St. Anthony, and in the meantime the railroad went bankrupt and reorganized as the St. Paul & Pacific. The Wm. Crooks carried its first train load of passengers on June 28, 1862. Those aboard that train included the Governor of Minnesota and many other dignitaries who were either famous then or soon would be, including Henry Sibley, Alexander Ramsey, and Hill himself. The locomotive and several newly constructed passenger cars chuffed out of St. Paul at 2:30 p.m. on its initial run to St. Anthony, signifying the completion of the first 10 miles of railroad, returning at 6 p.m. Four days later the Wm. Crooks began regular service between the then fledgling Twin Cities. The Crooks was originally built as a wood burner with a very small tender that held only two cords of wood. Pioneer steam locomotives like the Crooks weren’t just used to pull passenger trains. Their earliest and most important duty was to help build the railroad itself, bringing supplies used to build right-of-ways and small outposts that eventually became communities. The speed of trains back in these days was usually 15–25 miles per hour, but with good track and hearty fuel the Crooks could easily run 60 m.p.h. flat out. Good, clean-burning fuel was an issue. Supplies of fuel such as coal and kerosene were simply not available, but a ready supply of timber was usually on hand, free for the taking, requiring little more than a sharp axe to procure. Trees were cut and wood burned in the fireboxes of these early locomotives, heating river water in their boilers to make the steam that propelled the locomotives. But as engines like the Crooks needed to burn good quality, dried wood, fresh cut green wood gathered enroute often resulted in as much steam in the firebox as in the boiler. The outward appearance of the locomotive changed several times during its service career. Cosmetic changes occurred each time the railroad itself changed names: In 1879 The St. Paul and Pacific became the St. Paul, Minneapolis and Manitoba Railway, and in February 1890 Hill purchased the line and renamed it the Great Northern Railway. The Crooks underwent major boiler and firebox changes, and its domes were rearranged several times. When the engine was converted to burn coal, fake racks of wood were placed along the top of the tender sides to make it appear as though the Crooks was still a wood burner. The most drastic modifications came in 1868 when a terrible roundhouse fire partially destroyed the Crooks, which was housed inside at the time. The burned hulk of the locomotive and its final fate was in question until the railroad hired a man named Albion Smith to take personal charge of rebuilding the locomotive to its former glory. Albion became the locomotive’s personal engineer after the rebuilding project and was the oldest engineer on the Great Northern when he retired. He and Mr. Hill were good friends and it was Albion who kept Mr. Hill in the loop on all things concerning the Crooks. As the first of nearly 1,800 Great Northern steam locomotives that followed, the Wm. Crooks was venerated by the railroad company at Mr. Hill’s behest. It was maintained as a completely separate class on the active roster of engines until the transition to internal combustion power was completed in the mid-1950s. It was used in active passenger service until September 30, 1897 when it was rendered obsolete by more powerful locomotives. Although scheduled to be scrapped, Hill himself stepped in and had the locomotive restored to pull his own private train. 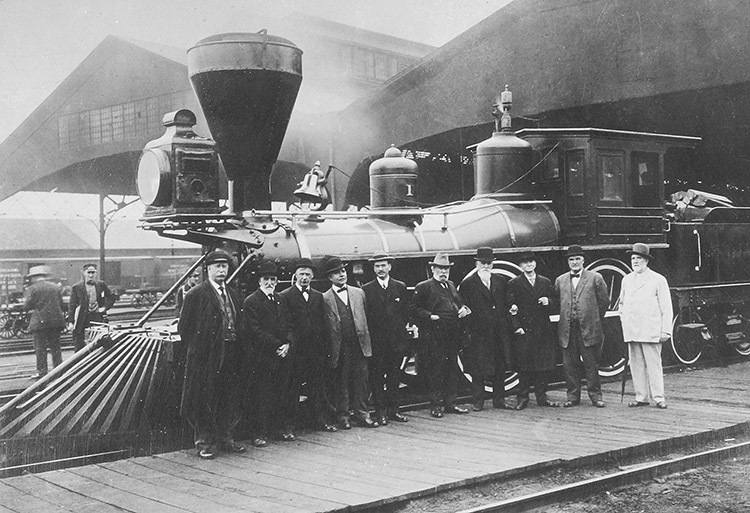 The last official use of the locomotive for true railroad functions is believed to be Hill’s 70th birthday in 1908. The Wm. Crooks began a very active old age after its retirement from active service in 1897. As mentioned, it served as Hill’s private locomotive until his passing in 1916. During 1924 it made trips from Chicago to Seattle and in 1927 it was displayed at the Baltimore & Ohio Railroad’s “Fair of the Iron Horse.” It even played a grand role in a live, staged play at the 1939 New York World’s Fair. There, along with the Northern Pacific’s Minnetonka locomotive of roughly the same vintage, the Crooks rolled onto the stage under its own steam with replicas of the first cars it pulled back in 1862. The Wm. Crooks made many appearances at community events—in many cases in communities that the little locomotive actually helped to build. The engine’s last big show was the Chicago Railroad Fair in 1948–49 as part of the “Wheels A-Rolling” pageant. After that, the engine’s cylinders, rods and bearings were all rebuilt one last time at the Great Northern’s Dale Street Shops in St. Paul. The Wm. Crooks was added to the National Register of Historic Places on April 5, 1974. Shortly thereafter a new home was created for it in Duluth when it was moved to the Lake Superior Railroad Museum located on the lower level of Duluth Union Depot in May, 1975. It resides there today—on indefinite custodial loan from the Minnesota Historical Society—resplendent in its original colors, exactly as restored by the Great Northern in 1948. The Wm. Crooks is one of just a handful of steam locomotives from the Civil War-era that survive today—and may well be the finest, most colorful example of any of them. It’s certainly one of the best kept locomotives from any era in railroad history and a true historic treasure for the State of Minnesota—and Duluth. Special thanks to Charles F. Martin for his kind contribution to this story adapted from his book, Locomotives of the Empire Builder. Charlie was a good friend of author Jeff Lemke and an expert on all things Great Northern. He founded the Fraternal Order of Empire Builders that eventually became the Great Northern Railway Historical Society. Long live the Great Northern!